As manufacturing evolves with the digital world and skilled workers retire, a shortage of two million workers in the next 10 years is anticipated by Deloitte and the Manufacturing Institute studies. Help close the manufacturing talent gap. Use Deloitte’s newly published infographic to help dispel industry misperceptions and lay out the benefits for pursuing a career in manufacturing. 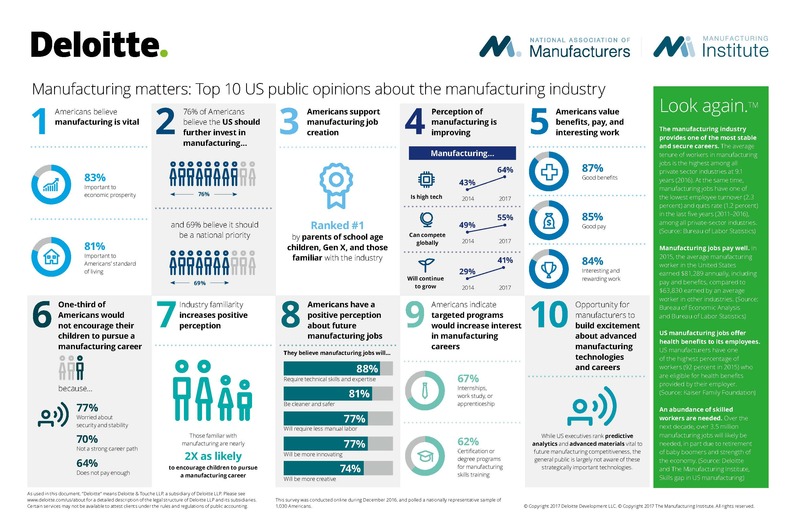 The infographic uses data from Deloitte’s sixth U.S. public opinion survey on manufacturing. To learn more about the study’s findings on Deloitte’s website. Check out and share “Creators are wanted,” videos on the manufacturing jobs of the future, an initiative by the National Association of Manufacturers (NAM).